The new hybrid operating room (OR) at VGH combines the most advanced imaging technology with leading edge surgical facilities so that our accomplished medical professionals can do what they do best: save and improve lives. By bringing advanced imaging technology right into the OR, patients no longer need to be transferred back and forth between radiology and the OR, saving critical time when a life is in the balance. Click the image below to take a 360 degree tour of the hybrid OR, and make sure to click on key pieces of equipment to learn more about the technology your donations help provide. The Future of Surgery is vital. And so are you. Sign up now to receive stories of innovation and inspiration, and stay up-to-date on how you can help transform health care in BC. We will not share your email address with anyone, and you can unsubscribe or adjust your preferences at any time. 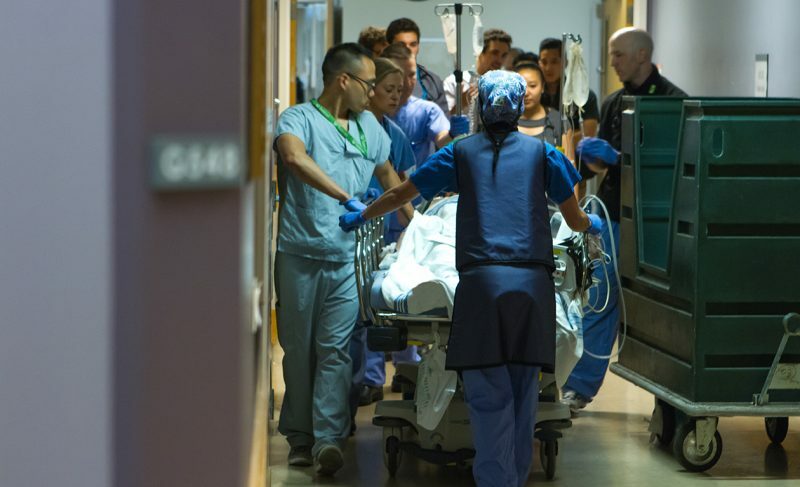 VGH is one of only two accredited Level 1 adult trauma centres in BC. As a leader in the field of anesthesiology, Dr. Hamed Umedaly and his team provide vital surgical support for thousands of patients each year — relieving them from pain before, during and after surgery. Dr. Dianne Miller and the Ovarian Cancer Research (OVCARE) team have revolutionized care and prevention of ovarian cancer. Our cancer experts like Dr. Miller are improving survival rates for the 2 in 5 British Columbians who will face cancer. 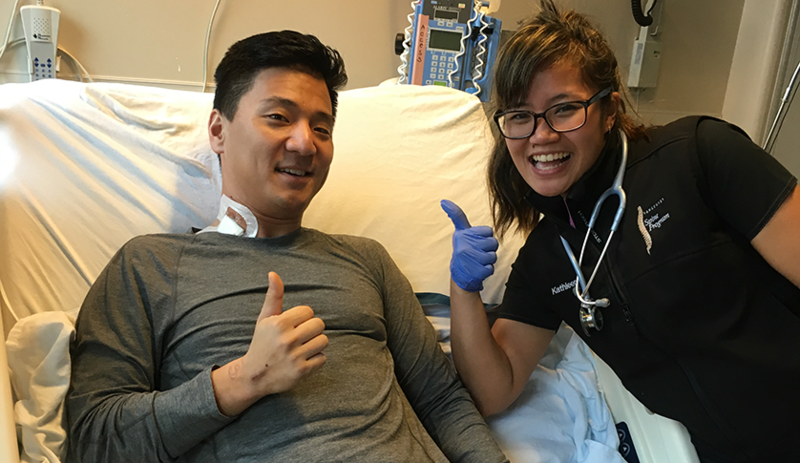 Dr. John Yee is BC’s leading lung transplant surgeon. He and his team performed 50 double lung transplants in 2018. VGH performed BC’s first organ transplant 50 years ago, and now performs over 50% of all life-saving organ transplants in BC. VGH and UBC Hospital are centres of surgical excellence. A $145 million transformation of the surgical facilities at VGH and UBC Hospital is under way, and we need your support to get there. VGH & UBC Hospital are building capacity to better meet patient demand for both emergency and scheduled surgeries. At UBC Hospital investments are required to increase its capacity for higher acuity patients and more complex procedures. As part of the OR renewal project, UBC Hospital will see new and improved in-patient units, designed to support patient-centered care, including a new high acuity unit that will support more complex scheduled surgical cases and sicker patients. These improvements will allow more scheduled surgeries to be moved to UBC Hospital, allowing VGH to focus on emergency and trauma surgeries. This will result in fewer cancellations and will reduce patient wait times for non-urgent procedures. Image courtesy of Vancouver Coastal Health. VGH’s current operating rooms were designed in 1979. Health care has evolved since then, and just like you wouldn’t want to use a 40-year-old cordless phone, these ORs simply weren’t designed for today’s technology and standard of care. 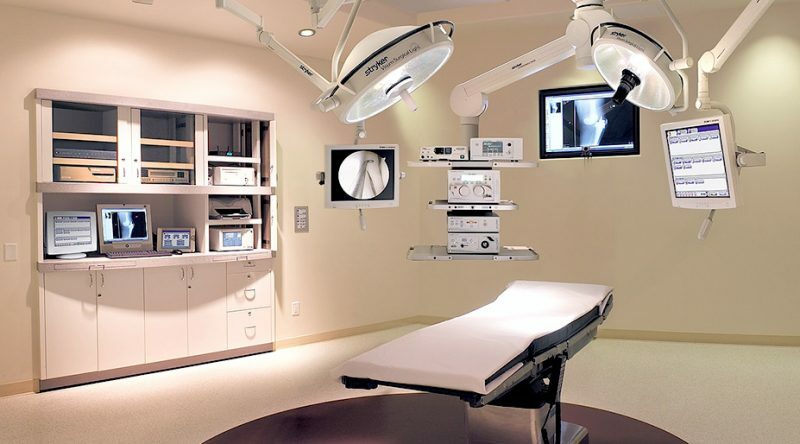 • State-of-the-art surgical equipment to support minimally invasive technology, wireless technology, electronic health records and digital X-ray equipment. • High ceilings to mount lights, monitors and three articulating booms, increasing available floor space to improve flow and reduce clutter. • A shared sterile core between procedural zones to maximize efficiencies for cleaning instruments and reducing turnover times. • Common features so that each room can host any type of surgery, with extra space to accommodate additional equipment as needed. In a future phase of development, additional space will be renovated to create a total of 30 operating rooms: a 30% increase. Rendering of new operating room at Vancouver General Hospital. Image courtesy of Vancouver Coastal Health. Renovations will include a new 40-bed perioperative care unit. This will combine pre-op and post-op recovery areas for more efficient care and a better patient experience to aid recovery. Providing patients with the care they need takes planning, expertise and investment. A $145 million transformation of the surgical facilities at VGH and UBC Hospital is under way. And while Vancouver Coastal Health and the provincial government are funding the majority of the costs, our Future of Surgery campaign is raising $60 million; with $50 million already raised. Donations have already been put to use — saving the lives of patients every day. The new hybrid operating room at VGH brings imagery equipment right into the operating room, allowing surgeons to order additional imagery in the middle of surgery, reducing the need to transport patients in and out of radiology. This optimizes surgical procedure times and patient safety. Take a 360 degree tour of the Hybrid OR. VGH OR physicians, nurses, and pre and post op staff worked together through several dollhouse sessions to help design the layout of the new universal operating rooms. By using scale models of the new rooms and 3D printed equipment, staff collaborated on possible layouts. Surgical nurses proved especially insightful, as they set up operating rooms, and unlike surgeons, they move throughout the room during surgeries. Following the dollhouse sessions, life-size mock-up sessions were held where physicians and staff put their recommendations to the test to determine whether they can work safely and efficiently in a wide range of surgical scenarios. 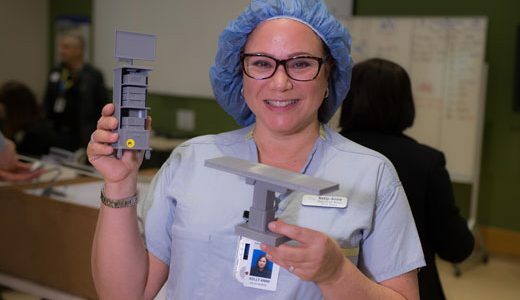 Kelly-Anne Karse, Head Nurse of the VGH OR Control Desk, holds 3D-printed equipment pieces used during an OR dollhouse design session. Image courtesy of Vancouver Coastal Health. 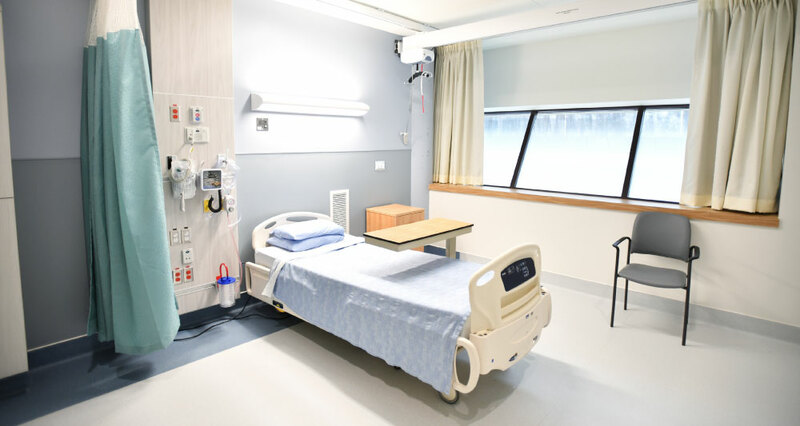 The completion of both of these spaces marked phase one of the UBC Hospital redevelopment, creating additional space to be utilized in phase two. UBC Hospital’s new Sacred Space offers a safe, serene and welcoming place for anyone seeking peace of mind and spiritual healing. The new space is readily accessible for all within steps of the front entrance. Natural light fills the room through floor-to-ceiling windows with a garden view. Specially designed for spiritual care, the larger space also features enhanced ventilation to accommodate ceremonies involving incense and smudging. The Leon Judah Blackmore Centre for Sleep Disorders includes nine patient beds that can be used day or night, allowing for 24-hour use. With dedicated rooms for patients care and research, the work that goes on here will be providing people with a key aspect of a healthy life – a good night’s sleep. 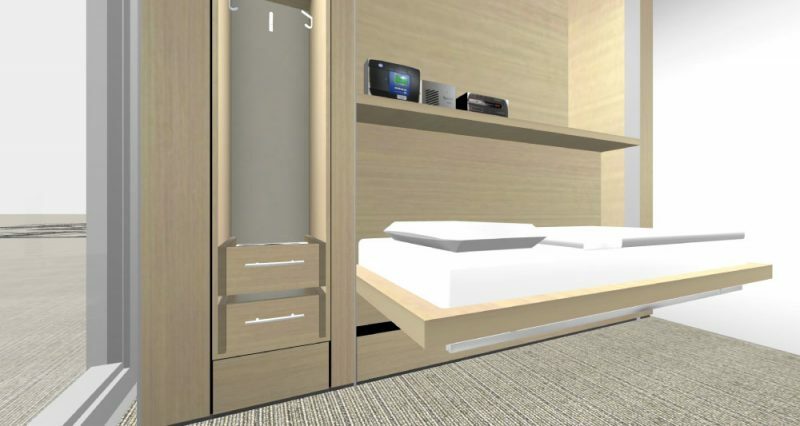 Rendering of a room in the Sleep Centre, which serves as a clinic by day and sleep lab by night. Image courtesy of Vancouver Coastal Health. Pardon our mess! Demolition began in Fall 2018 to prepare for the OR renewal project at VGH. Part of the planning process included ensuring minimal patient disruption during this potentially noisy time. The Complex Medical Activation Unit (CAMU) cares for patients recovering from conditions that require extra support. These patients benefit from an in-patient unit that includes both medical and rehabilitation therapy support to enhance recovery and allow them to safely return home or to community care. This enhanced and expanded in-patient unit is designed to better support patient-centered care. It includes an eight-bed High Acuity Unit that will allow UBC Hospital to support more complex surgical cases and sicker patients. Building 16 new ORs, a 40-bed perioperative care unit, and supporting infrastructure is a big job. Construction has been carefully planned to have minimum impact on current surgeries and patient care. Members of the Gaglardi family tour the construction site that will become the Phil & Jennie Gaglardi Surgical Centre with VCH and foundation staff members. Years of planning and support from donors like you will come to full fruition when VGH opens all 16 new operating rooms and a 40-bed perioperative care unit, newly named the Phil & Jennie Gaglardi Surgical Centre. This exciting milestone will mark the completing of Phase 1 of the OR Renewal Project. 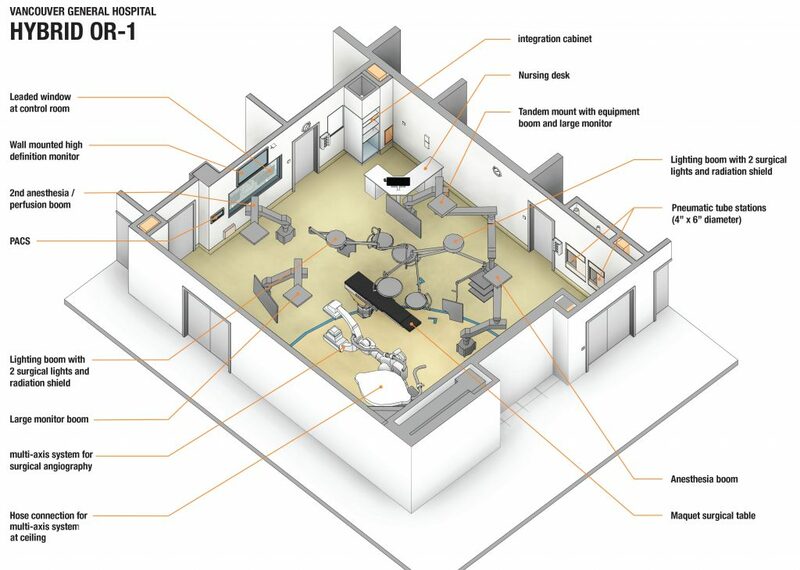 Renovations of existing ORs will create a total of 30 state-of-the-art ORs: a 30% increase. The Future of Surgery is made possible by you. Thousands of British Columbians have already donated over $50 million to our Future of Surgery campaign — thank you. With less than $10 million to go, every dollar donated to our Future of Surgery campaign will help save lives and transform health care in British Columbia. You’ve already helped us make amazing progress! Take a look at what we’ve already accomplished, the exciting developments currently in progress, and meet some of the generous donors who have already committed to changing the face of surgery in BC.